The Red tail catfish is native to the Amazon, Orinoco, and Essequibo river basins in South America. They are possibly the most common introduced fish species anglers will encounter when fishing in Thailand. Thailand is a tropical country so the waters here are warm which has meant some really interesting and exotic fish such as the giant Alligator gar (Atractosteus spatula), Silver arowana (Osteoglossum bicirrhosum) and Tambaqui (Colossoma macropomum) have been introduced into man made fishing lakes right around the country from North to South. For anglers going fishing in Thailand the array of imported game fish species makes for a really exciting prospect. The "Ball Cutter" fish aka red Bellied Pacu are very common in Thai fishing parks. They are heavy feeders and will give a really hard fight up to the net. The legend of the "ball cutter" name goes, that in Brazil there was an incident where a Pacu mistook a man's testicles for some floating Brazil nuts. Ouch, The teeth are sharp and jaws are strong, built for cracking nuts. Some introduced (invasive) species have inevitably found their way into the natural Thai environment. There are now known to be Peacock bass , a species considered extremely invasive in some reservoirs and large lakes around the country. 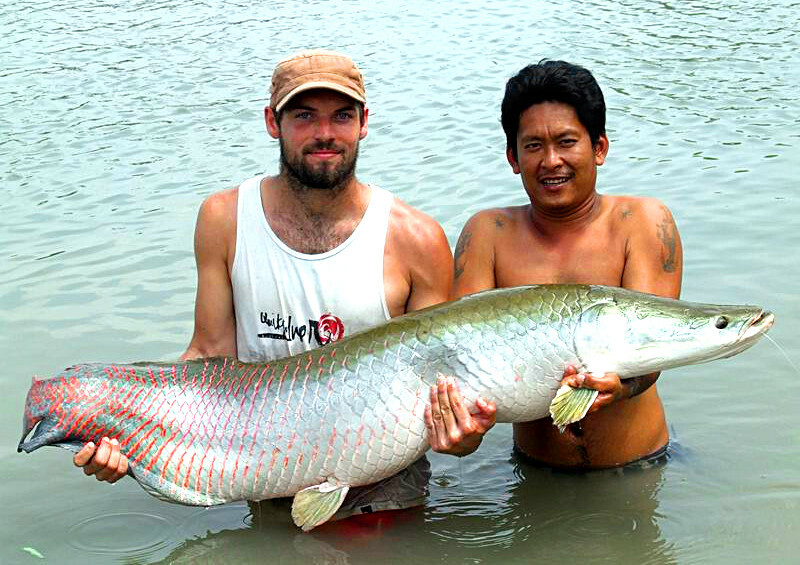 Probably the most attractive and well known non native Thai fish species to travelling anglers in Thailand is the Pirarucu or Arapaima. This fish is among the biggest freshwater fish in the world, it is legendary for its fighting strength and grows to massive proportions in Thai fishing lakes where they are well fed and always released. A specimen of approximately 185Kg (407lb) has been caught from Bungsamran lake in Bangkok.